Each year, over one million people crowd Times Square to watch the famous New Year's Eve Ball drop in Times Square while celebrities like Lady Gaga host and millions more watch comfortably from home. But why hang outside in the cold or on your couch while others heat it up and let the champagne flow in some of New York City's premiere party hotspots where you can watch the ball drop projected on a jumbo screen and actually rub elbows with the celebs? Need another excuse to don that party attire you got as a holiday present? If the world is slated to end in 2012, don't you want to ring in the New Year in a large way, especially if it's going to be your last year on the planet? Alright, you're convinced, so you'll need somewhere to go on the most magical night of the year. Since you'll be up and out until way past midnight anyway, The City that Never Sleeps offers the most options for crossing the velvet ropes and guaranteeing a great evening. It's no surprise the Big Apple is a top destination to ring in the New Year. In fact, this year, New York City dominated Priceline.com's list of top New Year's Destinations for U.S. travelers for the first time in seven years, with NYC neighborhoods taking nine of the top 15 spots and ousting Las Vegas. Jay Shetty, partner of The Blaq Group, a full-service events management and digital PR agency for the hospitality industry in New York City which has hosted New Year's Eve events for over 11 years, attributes the reason to the diverse makeup. "Essentially you are celebrating with the world in NYC," Shetty told IBTimes. "Any other place, you're just celebrating where you are. Even though people are at different events, you can collectively feel the energy of the city pulsating through the streets." The best thing about celebrating New Year's Eve in New York City is the proximity to the ball. The tradition of dropping a nearly 12,000 pound crystal encrusted globe at One Times Square dates back to the early 1900s, according to Times Square Ball, when it was first deployed in Times Square. More than 100 years later, the tradition lives on. While others will be cramped and cold, though this year will be in the mid-30s according to weather reports, spending the night indoors with free flowing libations is always a better option. You won't miss a thing anyway, as most venues in New York City stream a live feed of Times Square on giant projection screens in addition to the open bar, midnight champagne toast and hors d'oeuvres served for New Year's Eve. However, many venues sell out of pre-sale tickets quickly or charge higher admission prices at the door. "Money trumps all on one of the biggest nights of the year for the hospitality industry, meaning many of your normal it spots are bought out, sold over capacity, or outsourced," Shetty said. Therefore, it's always best to plan as early as possible, according to Shetty. "Focus on finding a venue that has a good track record with New Year's Eve," Shetty said. "A-list venues during the year don't translate to A-list parties. Open bars are great but if you can't get to them it doesn't matter." Instead, Shetty recommends purchasing a VIP table service on Dec. 31, as it guarantees what he calls "real estate within a venue." So if you're not in the mood to spend the night at home and still haven't made plans, the International Business Times selected the top 10 venues to celebrate New Year's Eve 2012 in NYC. There's certainly no other way to ring in a festive New Year's Eve than Celsius nestled within Bryant Park. The restaurant lounge is decked out in a winter wonderland theme, with specialty hot alcoholic beverages that will warm your heart along with your chilly body. The two-story indoor/outdoor venue will offer a five hour premium open bar in addition to a yummy menu of appetizers. And if testimony means anything, New Year's Eve 2011 at Celsius was larger-than-life. While it's certainly not the cheapest option on the list, it's certainly the most glam. At Capitale, you'll be rubbing elbows with Manhattan's elite in the Venetian styled edifice known to attract A-List celebs like Anna Wintour, JayZ and Eva Mendes. The six hour open bar and fabulous crowd is merely an added bonus to the decadence. If being far from the Times Square chaos isn't enough reason to check out the party at the Soho Grand, how about the mention it will be a Black and White Masquerade Ball? How about the fact it will be hosted by Christian Siriano, Mena Suvari, and Steven Rojas? Masks are mandatory! If you're looking for a black tie event, the bar on the Top of the Standard Hotel is the venue for you. A favorite of Lindsay Lohan's and Kim Kardashian's, guests should don tuxedos for men and fancy cocktail dresses or full length gowns for women for the formal occasion. This Meatpacking District is a hotspot on any given night, but on New Year's Eve, DJ Brooklyn Dawn will spin at SL. In addition to the world-renowned DJ, SL will broadcast the 2012 countdown and host a complimentary champagne toast at midnight. 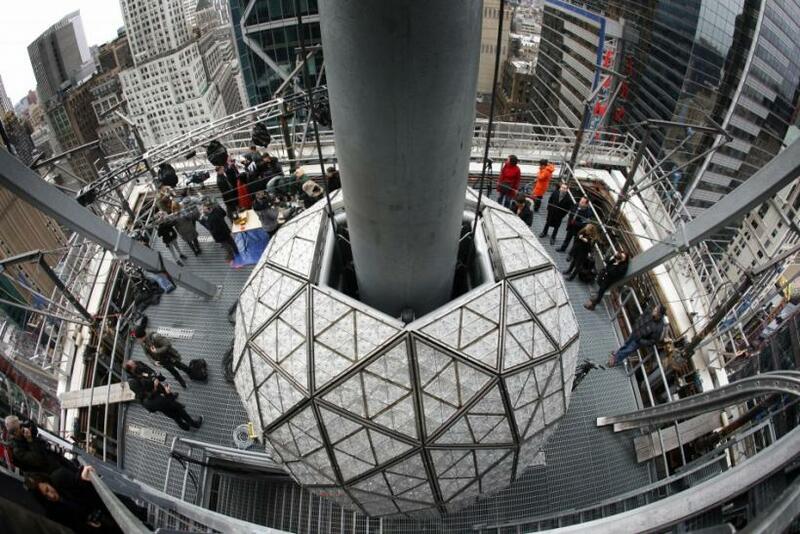 Hoping to catch a glimpse of the Times Square Ball? Well Highbar is the place to do it, as you'll be spending it from a rooftop loft 16 stories above the streets of New York, nearly looking down at the ball. The urban oasis will have all the amenities a New Year's Eve venue should have with a panoramic view of the cityscape and Times Square. Can't decide on a venue? How about a cruise around the entire island, away from the mobs of people? NY Water Taxi is offering an affordable option for those looking for some maritime for New Year's 2012 with a three hour cruise which includes food and an open bar. Forgive a New Yorker for editorializing, but Pranna is hands down the ultimate New Year's Eve experience. The ultra-luxe restaurant known for its high-end Southeast Asian fusion cuisine provides an exotic multi-tiered experience with three floors and 15,000 square feet of eco-consciously designed space (imagine that for New York!). While situated in the Flatiron District, Pranna will broadcast a live feed of Times Square on a projection screen on the main floor while bottles pop all around to ring in the New Year. Gustavino's isn't just a decadent place to spend New Year's Eve but is also a New York City landmark. In Style, Page Six and New York Magazine touts Guastavino's as the it spot frequented by prestigious socialites and fashionistas from across the globe. For the best deal, without sacrificing fabulousness for New Year's Eve, the Greenwich Village Country Club, or as some call it the GVCC, is offering a $75 general admission fee which includes a five hour premium open bar and champagne toast a midnight in addition to entry. After scouring the web, there's no other trendy, yet frugal (by New Year's Eve standards), option out there!